You drink it, you bathe in it, and you even wash your clothes in it; so shouldn’t you be taking better care of it? Dealing with hard water isn’t necessary, and if you want the very best for you and your home then you need a water softening system. By reading our reviews of the best water softeners and following our simple guidelines, you will be absolutely sure to find a system that is efficient for both your home and wallet. Don’t be the person who wastes money on buying the first unit they see, there are a few important details you need to know that can save you time, money, and possibly even a headache. 2 The Different Types Of Water Softeners. 7 Where to Buy Water Softeners? If you’re looking for a water softening system that is both reliable and affordable, then you can’t go wrong with the Fleck 5600SXT. This unit has more five-star reviews than any other and does a great job of eliminating hard minerals in your water. The 5600 valve works extremely well and even comes with a five year warranty; not to mention it has been tested to run continuously for up to 27 years. The SXT controller is built upon the 5600 valve and adds a lot of great features such as a backlit LCD display, 48 hour internal power backup, and touch pad controls. With meter-based regeneration this unit will only regenerate when it needs to, this will save you a lot of money over time. Not only will you have to spend less on both salt and water, you’l be more eco-friendly as well. The actual tank on this unit is made with a durable poly-glass and comes with a 10 year warranty. The brine tank that is included can hold up to 250 lbs. of salt pellets and comes with a safety float to prevent overfilling and an overflow drain just in case. If you have some basic plumbing skills you should be able to easily install this unit in 1-2 hours. Are you tired of the unappealing lime scale that covers your sink, faucets and showers, but don’t necessarily want to buy a water softener? 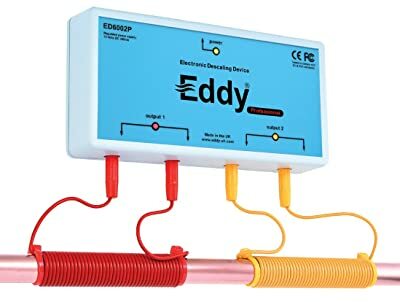 Well then the Eddy Electronic Water Descaler might just be the perfect solution for you. Instead of eliminating the hard minerals through a process known as ion exchange, a descaler simply alters the properties of the minerals and keeps them from forming into lime scale for a small period of time. It does this by placing two coils around the incoming water supply pipe that releases an electro-magnetic wave. While this doesn’t give you all the benefits of soft water, it does get rid of the formation of lime scale on clean surfaces, in your pipes and plumbing, and in many of your water appliances. Wherever water sits for an extended period of time though lime scale will still begin to form. The benefits of using this descaler is that it is much cheaper than buying a softener, doesn’t require any salt or maintenance, and is very easy to install without any changes to your plumbing. This makes it very economical and not to mention more eco-friendly than your traditional salt-based unit. If you’re in need of a portable water softener for your mobile home or RV, then you can’t go wrong with the Watts RV PRO-1000, also known as the M7002. Since most camping grounds have a serious hard water problem, this unit is almost necessary addition to any camping trip. Unlike traditional units, the RV PRO-1000 runs on ordinary table salt. This is extremely convenient so you don’t have to carry around a giant bag of salt pellets everywhere you go. Testing strips are even included so you can see the levels of hardness in your water before and after the installation. Installing the unit itself is extremely easy and straightforward, and at a size of 8 x 22 inches it doesn’t take up much space at all. All that is required for regeneration is 2 pounds of salt and you’re good to go. The whole regeneration process only takes around 20 minutes. The Model 220 is an extremely compact unit that is built to give whole-house efficiency for families up to 4. At a measurement of 14 3/4 wide, 18 3/4 in depth, and only 25 3/4 tall, this softener really is small and powerful. 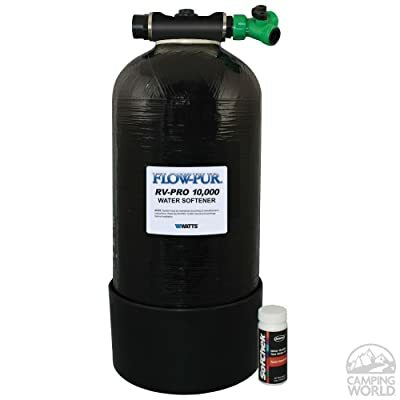 With the ability to soften up to 70 gpg (grains per gallon), reduce up to 10 ppm (parts per million) of ferrous iron, and filter dirt and sediment down to 20 nominal microns makes this unit really great at softening water as well. Due to the small size of this unit it can regenerate in a short time of around 18 minutes at a salt setting of 2.5 pounds. Being able to regenerate so quickly means less water is used so you save more money. The best part is the installation is very simple and easy to follow. Have a decently big home and a serious problem with iron or manganese in your water? If so then the Iron Pro 2 64,000 grain water softener is the perfect solution. This is because of the fine mesh resin that is made to last longer and filter better in water with heavy amounts of iron. Besides filtering ferrous iron and manganese out of your water more efficiently, this model treats hard water extremely well at a rate of 16 gpm (gallons per minute). This unit removes hardness up to 75 gpg, Iron up to 6-8 ppm range, Manganese up to 6 ppm, as well as filtering out the rust, sand and sediment. With the meter based regeneration this unit will only regenerate when absolutely necessary. If you increase your water usage then the system will regenerate more often, if decreased then less often. This saves you money on not only water but on salt pellets as well. Included is the Fleck 5600SXT digital controller which is built upon the 5600 valve. This digital controller comes with features such as a backlit LCD display, 48 hour internal backup and touchpad controls. The Different Types Of Water Softeners. Ion Exchange: Salt is used to remove magnesium and calcium from the water. These are the two primary mineral deposits that make your water hard. Salt replaces the other two minerals which doesn’t cause scale or build up in pipes, or fade the colors in your laundry. Descalers (Salt-Free): Leaves the magnesium and calcium minerals intact, but prevents them from creating scale or build-up in pipes or appliances. That image to the right is what the inside of your homes plumbing could look like if you aren’t using a water softening system. After reviewing the damage that these mineral deposits can cause is it any wonder that investing in one of these systems could possibly save you hundreds if not thousands of dollars. Once these minerals build up inside the pipes they are nearly impossible to remove. Over time the pipes began to erode further and further until you have a costly repair bill on your hands! Plumbing repairs aren’t cheap. So keep your pipes clean! Who doesn’t long for that morning cup of joe. Did you know that using hard water could actually be damaging your coffee maker. The problem isn’t just limited to small appliances. Your clothes washer, dishwasher and your refrigerator are both likely hooked up to your homes plumbing. Hard water can actually be sending these very costly (much more expensive than a water softener) appliances to an early grave! No were not talking about the latest Hollywood gore movie. Were talking about that slimy, nasty, film that seems to cling to every dish you’ve ever owned. Remember the day you first brought home that new wine glass. Now, no matter how hard you scrub its got that foggy look to it. Using a water softener will turn your daily kitchen chores in a breeze. Or perhaps just another drop in the bucket of delicious water! Picture this, you’ve got a hot date with a brand new girl. Or perhaps you’re taking your spouse out for a night out on the town. Every item of clothing you own looks faded and old. How could you have possibly prevented your expensive wardrobe from looking more dull and depressing than life in Soviet Russia. 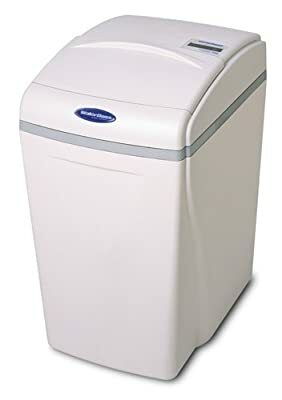 Just to review, if you’re not using a water softener your making it THAT much harder for your laundry detergent to clean your clothes. Much of the detergent is used to actually soften the water so the fabric can be penetrated. This is bad for your clothes, bad for your washing machine, and bad for your sense of style. 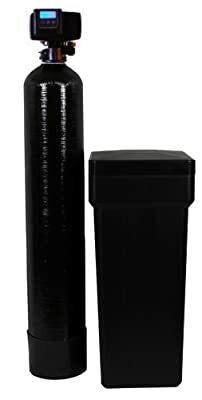 Are you wondering what size water softener you need? Use the form below to calculate what your households daily needs are. You will need to know the GPG or grains per gallon of your local water supply in order to accurately assess what size softener is best for you. You can use the USA Water Hardness map as a general reference if you are unsure, or unable to test your water. However, it is highly recommended you use a water hardness test kit and take the guess work out of the equation. Note: Its important to acknowledge that these calculations are by no means the end all be all in determining what size softener you use. Some professionals recommend other methods of calculated necessary grain capacity. This tool is meant to be used to give you a general idea as to what you need to look for before deciding on what brand and model you or your plumber will be installing. To find the right size unit to buy for your home, you need to do a little bit of math; this is where the test kit comes into play. The way that water softeners are measured is in the capacity of grains or grain removal. Softeners come in sizes of 15000, 24000, 32000, 40000, 48000, 64000, 80000, and 110000 grain removal capacity. Buying a size too small can lead to hard minerals making their way through, pressure drop, and even fluctuating water temperature. Buying a size too large will just cost you more than needed but will allow you to regenerate less often. Regeneration is when the hard minerals are flushed out of the resin tank and replaced with sodium so that your water will continue to soften. This should occur only once a week to avoid wasting money. A 32,000 grain softener would be the perfect fit for this household, by putting in your own measurements you will know the proper size for your home so you can get the best unit possible. Couple this with reading water softener reviews of high rated units of the right grain capacity and you will have a highly efficient unit that will bring great results and save you money in the process. While 85% of the United States deals with hard minerals you could be the rare exception. Look at the map below to get an idea of the hardness levels in your area. So you’ve decided to buy a home water softener system, but are you positive you actually have hard water? Do you even know what it is? Well when water passes through rocks and soils underground it carries along with it the hard minerals known as calcium, magnesium, and other metals. These hard minerals cause many negative side effects to both you and your home, and the best solution to remove them is by ion exchange, or otherwise known as water softening. Below are some of the main side effects associated with hard minerals. Scale from dissolved calcium and magnesium will build up in your plumbing fixtures resulting in clogged pipes and erosion, thus reducing water flow. Reduces the ability for soap to lather, causing you to use more. Hard minerals enter into cloth fabric to make clothes feel rough and look dingy, shortening the life of your favorite shirt by as much as 40%. Soap mixed with hard minerals will leave a sticky soap curd that can damage your skin, hair, and cause you to clean your shower or bath tub more often. Any appliances used to heat water will have a shorter life and an increase in utility bills (scale is a bad conductor of heat so more energy is needed). The minerals affect the taste of coffee and tea. Hard minerals will leave dishes with a film and looking spotty, especially when cleaned with a dishwasher. If you have noticed any or all of these effects in your home then you have hard water. But actually knowing you have hard water isn’t enough; you need to know the actual level of hardness to make sure you get the best softener for your home. Hardness is generally measured in grains per gallon, or GPG. When measuring in grains per gallon, if the hardness level is 0 to 1.0 then it’s considered soft, 1.0 to 3.5 is considered slightly hard, 3.50 to 7.0 is moderately hard, 7.0 to 10.50 is hard, and 10.50 and above is extremely hard. In order to find out the levels of hardness in your home you will need to buy a water test kit. Knowing this number will help you find the most efficient system for your home. Where to Buy Water Softeners? The best water softeners and filters are readily available for purchase on various online stores. However, most sites usually incorporate high prices on their systems, which render them an uneconomical choice. Amazon is one remarkable site where you can get all the systems at a discounted price. To add to this, the site offers free shipping to your country of residence. This will save you the hassles associated with the purchase and transportation of your water treatment system. Getting access to sufficient and clean drinking water is something that most people usually yearn for. The above mentioned best water softener and filter models are a perfect solution to realizing this. They prove to be an economical choice in the long run besides offering you with exceptional durability to last you for decades to come. Therefore make a point of going online at Amazon and purchase yourself one of these remarkable water treatment units. You will definitely be happy that you did so. I have an iron reading of 1.21 and a manganese reading of 0.385,with a party of 2 adults and one child.What type of system will get me by.This is a rental,so dont want to go all out,cause some tenants dont take care of it like it was their own.